Dyer Environmental Controls Ltd were asked to design and install a bespoke, certified mechanical smoke ventilation solution at The Frontage Student Accommodation. The Frontage, whilst being a highly complex building, places emphasis on student safety, and achieves this through 24 hour CCTV, a secure electronic entry system and fire and smoke ventilation systems. The building is mixed use with the upper floors contain 173 self-contained studios, the ground floor hosting retail, and the lower ground floor which is used as amenity space for the residents of the student accommodation. This floor contains a number of features, including a private gym, on-site cinema, games room, communal lounge, and work rooms. Dyer created a bespoke solution using discrete ventilation grilles throughout the accommodation, both internal and external. All of which are connected by a concealed system of fire rated duckwork. 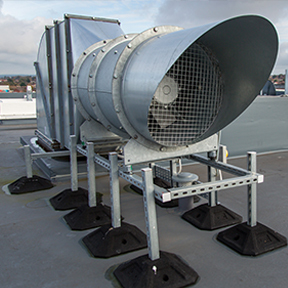 The smoke extract ventilation system has been designed to comply with the airflow requirements of the Building Regulations Approved Documents Part B, Part F and compliance with BS 7346-8, BS 5839-1, BS EN 12101-3. To achieve the minimum air change rate of 10AC\hr a total air volume of 3.6M3\sec has been provided to ensure that air is exchanged throughout the basement area. To achieve this air change rate in a fire condition, a forced mechanical ventilation system has been installed. The system comprises two smoke extract system located adjacent to the lift cores and designated as extract system 1 and extract system 2 where each are rated to deliver 50% of the overall air volume required. Make up air is provided by forced inlet to support the extract system 1 where extract system 2 draws air in from opening roof lights. The central air handling plant is located in the mezzanine plantroom boiler house where the system is routed through to the basement area via a newly formed riser using fire rated ductwork. The inlet grilles from the basement area are positioned within the walls and will draw air in from the flexible working space, gym, cinema and games room. The extract fans assembly comprises 2No 710ᴓ short cased axial fans (Fan Model LCS063P2-A3/21) bolted together to operate as a duty and standby arrangement. Both fans are fitted with variable speed drives which operate as soft starters and for the final flowrates to be commissioned. The make-up air for this area is supplemented by a forced fresh air system drawing air in directly from outside. The fresh air handling plant is located in the service yard directly above the mechanical plantroom in the basement and routed into the basement area in fire rated ductwork. This unit is also wired through the fire control panel and will work in tandem with the smoke extract fans. The gym and cinema have supply air introduced to the rear of the room with the extract from the rooms being via the grilles and fire rated smoke damper arrangement mounted in the wall which opens into the flexible space. When the system is in fire mode the dampers opened to allow the air to be evacuated into the flexible working space to be extract by the central system. The central plant is located in the AHU plantroom on the mezzanine floor with the fire rated ductwork routed through an existing void to allow extract at high level above the syndicate room. The inlet grilles from the basement are positioned within the wall at high level and will draw air from the syndicate room void, common space and games zone, space, gym and cinema. The make-up air for this area is supplemented by a natural fresh air system drawing air in directly from outside. This is achieved by introducing the fresh air via the opening roof light in the game zone which has a direct link to the service yard above. The roof light incorporates an actuator which allows the vents to be opened when the system is operating in fire mode and allows fresh make up air to be drawn into the basement area. The actuator units are wired through the fire control panel and work in tandem with the smoke extract system. The small offices have supply air introduced to the rear of the room with the extract from the rooms being via the grille and fire rated smoke damper arrangement mounted in the wall which opens into the common room. When the system is in fire mode the dampers open to allow the air to be evacuated into the common area to be extract by the central system. 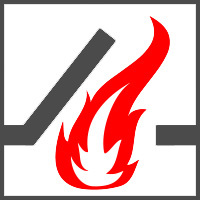 The supply and extract ductwork within the building is fire rated to handle 300°C for a minimum of 60 minutes. The extract fans are fire rated at 3000C for a minimum of 60 minutes, the supply fans are not fire rated due to the external location and being the fresh air supply are not required. The operating sequence in fire mode is configured so that initially the extract fans are switched to high speed and the supply fans are switched off and fresh supply fans remaining off. After a 5-minute escape period, the supply fans are switched on to high speed.